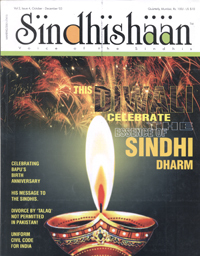 I have just received July-Sept issue of Sindhishaan. I think that this is yet another ‘land mark’ issue having galaxy of interesting and meaningful articles and variety of visuals. Your report as published, on the 10th International Sindhi Sammelan is lucid, smooth and is like ‘story telling’. In the process you have done ample justice to choice of words, presentation, grammar etc. to make it very interesting reading without a pang of boredom. Similarly your introduction of Prem Lalvani the Chairman of Alliance of Sindhi Association, the main pillar behind the success of the Sammelan, is yet another flower in the bouquet of roses. Ranjit, I have no doubt that you have an unflinching flair for journalism. You have acquired both ‘art & science’ of presentation. May be this is emanating from the nature of your business that you are in where presentation and playing it by ear are important attributes of success. Marvelous! Keep plugging. The words of famous Robert Browning come alive ‘Grow old along with me the best is yet to be’.